Pumpkin Banana Bread Recipe - Must Try, Delicious Recipe! 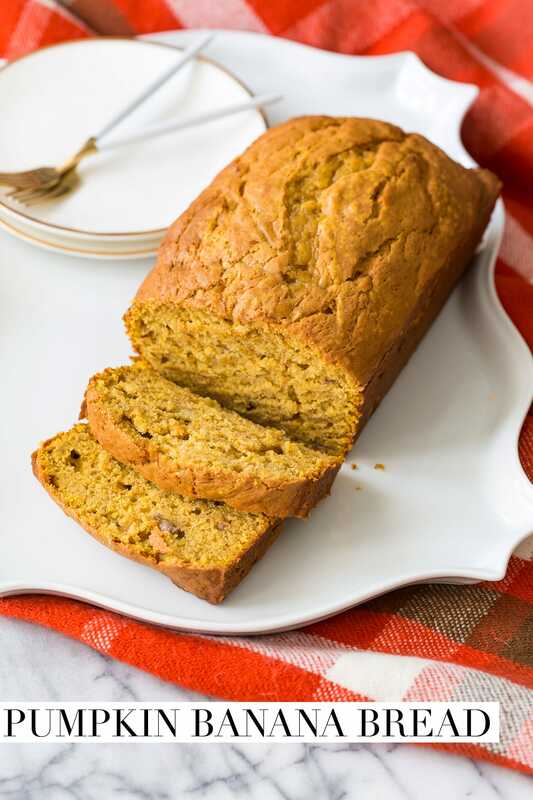 Pumpkin banana bread combines two of my favorite flavors into one dynamite bread recipe! I waited until the start of September, but I can’t wait any longer. It’s PUMPKIN season so let’s begin with a bang, shall we? Time for the best pumpkin banana bread you’ve ever tasted. It’s a nice ease into #allthingspumpkin because it still has all your favorite things about typical banana bread but with the added pumpkin flavor! I always seems to have over-ripe bananas on the counter, and that is the secret to a great banana bread. Over-ripe bananas are sweeter and easier to mash for your banana bread. So grab a few extra bananas at the store and let them ripen up. You’ll thank me later. Of course, stock up on pumpkin too! It’s fall, y’all! My Mom gave me her grandmother’s famous banana bread recipe – it’s over 100 years old! So we did a little baking to give it a pumpkin twist! It makes two loaves so half it if you prefer just one, but trust me – you’ll want two! Gift one to a friend. They’ll thank you — and then ask you for the recipe. You’ll notice little bits of banana in the recipe, they’re delicious. I recommend being sure your bananas are very ripe! This helps make them sweeter. You can certainly add nuts or even raisins to this recipe, but I like to make it with just the pumpkin and banana. It’s so good, trust me. If you want a sweeter pumpkin banana bread, add a glaze or frosting on top. Or if you love a certain spice, such as cinnamon, then add more in.You’ll instantly have a delicious, fall dessert! This recipe is perfect for fall brunches, tailgates, bake sales, etc. 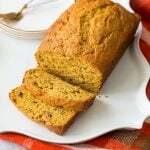 The pumpkin and banana make the bread so moist, it’s definitely a keeper! 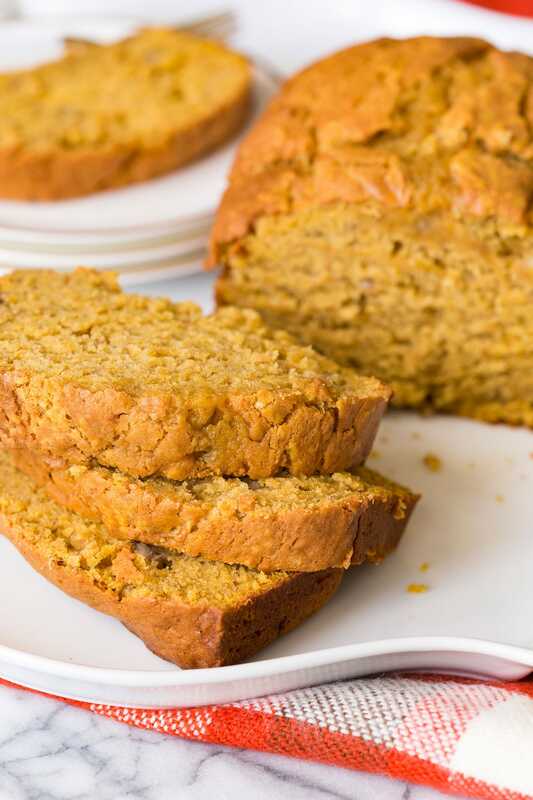 Moist and delicious, this pumpkin banana bread is a fall favorite! Preheat oven to 350 degrees F. Combine butter and sugar in the bowl of an electric mixer with paddle attachment. Cream together until combined. Add in eggs, one at a time. Add in canned pumpkin and mix until combined. Add in flour, baking soda, and pumpkin pie spice. Stir until combined. Stir in ripe bananas (mashed) and vanilla extract until mixed. Pour into two regular-sized bread loaf pans. Bake for 1 hour and 20 minutes. Oven times will vary, so insert a knife (or long skewer stick) into center to test for doneness. Don't have pumpkin pie spice? Don't worry! Combine 3 tablespoons ground cinnamon, 2 teaspoons ground ginger, 2 teaspoons ground nutmeg, 1 ½ teaspoons ground allspice and 1 ½ teaspoons ground cloves. This recipe makes two loaves! I cut approximately 12 slices per loaf. For more favorite pumpkin recipes, check out my chocolate chip pumpkin pie and pumpkin spice moscow mules! And if you want to try a pumpkin swirl cheesecake, check out my brother’s recipe here! Banana bread is one of my favorites, and we’ve made several varieties at our house. Love the idea of adding pumpkin to the mix too. One question: The recipe doesn’t mention mashing the bananas first. Should I assume that is done or do you just let the mixing do the work? One of the ways I’ve gotten a consistent flavor is to mash my bananas in a measuring cup to make sure I have the same quantity of banana in each batch. It’s surprising how much variation there is in banana sizes! Hi Betty, I just updated it to make it more clear. Yes, ripe bananas that have been mashed. If you’re using an electric mixer and just place in the bananas whole, the result would be pretty similar, but for detail-sake… I do mash mine with the back of a fork and add in. Can you make muffins out of this recipe? Donna, I believe so! I have yet to do this, however, so it might need some tweaking. I’ll try to try this myself soon (currently out of town on my book tour) but hope to try this soon and report back! Reading your other comment, looks like this could have affected things if you didn’t use the same size pans. It can vary if the pan is thicker and thus needs to cook longer. Again, the instructions were based on the pan size I gave but you’d have to bake longer for thicker pans or vice versa. Betty, I’m so sorry the recipe gave you trouble. Many readers have been sharing pictures with me of theirs and it always looks just fine. Perhaps it was varying by oven or altitude or baking pan type. We’ve had so many successes and I’ve re-made it many times with no issue. The ingredients are correct. Please feel free to adjust them if it doesn’t work for you. This is a great recipe! My husband couldn’t stop eating it. He kept sneaking into the kitchen to get more. I followed the recipe and it turned out perfect. Wouldn’t change a thing. I want to make this, but couldn’t see where you said what size pans you used. Where did I miss that? I use two regular sized loaf pans. thank you, I’ll give it a try this weekend.